ExoMars is the name for 2 missions to Mars and IASB-BIRA began their contribution in 2010. NOMAD is a 3-channel spectrometer developed by an international team that was selected from many proposals for the Trace Gas Orbiter that has been launched in March 2016. The aim of NOMAD is to better characterize the atmosphere of Mars - measuring vertical profiles of various species at different longitudes, latitudes and seasons; mapping possible sources and sinks of rarer gaseous species - for example methane; examining aerosols and their fluctuations over a Martian year. In Belgium, there are teams at IASB-BIRA, ROB, CSL and Université de Liège involved in the scientific preparation for exploitation of this mission. Engineers are involved at IASB-BIRA, CSL, OIP, Lambda-X and Thales Alenia. The expertise required ranges from mechanical engineer and CAD designer to hardware and software electrical engineers and calibration technicians. The design is already well advanced and NOMAD will pass from Phase C to Phase D via Critical Design Review (ESA chaired) in September. The data exploitation pipeline will also be prepared at IASB-BIRA, and operations will be planned from here. JUICE - JUpiter ICy moons Explorer - is the first large-class mission in ESA's Cosmic Vision 2015-2025 programme. Planned for launch in 2022 and arrival at Jupiter in 2029, it will spend at least three years making detailed observations of the giant gaseous planet Jupiter and three of its largest moons, Ganymede, Callisto and Europa. In Belgium, there are different teams involved in the scientific preparation for exploitation of this mission: at IASB-BIRA, ROB, CSL and Université de Liège. Engineers are involved at IASB-BIRA, ROB, and CSL. IASB-BIRA and ROB are responsible for the characterization of the flight and spare models of the VIS-NIR detector of MAJIS. EnVision is a mission proposed to ESA following the M5 call and which has been selected by ESA to enter Phase A . Planned for launch in 2032, EnVision follows on from ESA's highly successful Venus Express that focused primarily on atmospheric research. Planned to be implemented with NASA participation, next-generation EnVision would determine the nature and current state of geological activity on Venus and its relationship with the atmosphere, to better understand the different evolutionary pathways of the two planets.>. Venus Express is ESA's first mission to Earth's nearest planetary neighbour, Venus. The mission was born after ESA asked for proposals, in March 2001, suggesting how to reuse the design of the Mars Express spacecraft. Venus Express was launched in November 2005 and inserted into orbit around Venus in April 2006. The sapcecraft was finally loast in Dec. 2014. IASB-BIRA is has designed the SOIR instrument, one of the 3 channels of the SPICAV/SOIR instrument on board Venus Express. IASB-BIRA was also responsible for the data pipeline and archiving of the SOIR data. SPICAM is a space instrument onboard of ESA's mission Mars-Express, which has been orbiting around Mars since 2003. SPICAM has been observing since then and is still operating now. The instrument was partly built here at IASB-BIRA, in collaboration with the LATMOS (France) and IKI (Russia). It is a double spectrometer composed of an ultraviolet (UV) and a near-infrared (NIR) channel. The UV channel is mainly used to measure Ozone, CO2, and O2 and the NIR channel is used to study water vapor, CO2 and O2. Other components/parameters can be estimated by analysing SPICAM data such as pressure, temperature, aerosol's loading (dust or clouds), surface properties, etc. SPICAM is able to work with different viewing mode, which are Nadir, Limb and solar/stellar occultation. These different viewing modes allow different types of results. For exemple, nadir gives good spatial coverage of the planet and is used to obtain mappings of the studied quantities. Limb or occultations do not have such a good spatial resolution but have the advantage to investigate the atmosphere at different altitudes. We are developing at IASB-BIRA a retrieval algorithm in order to analyse the nadir UV data of SPICAM. The goal is to deduce the quantities of Ozone, aerosol's loading and surface albedo. We will obtain maps giving the evolution of these quantities over the period of SPICAM activity. We will also attempt to derive some optical properties of dust in the UV range. The developement of this retrieval program is also a preparation for the future missions. We will be ready to analyse data of the IASB-BIRA instrument's NOMAD which will be part of the future Trace Gas Orbiter mission. The development of a Global Circulation Model (GCM) for the atmosphere of Mars started in 2006. The GM3 model developed at York University (Canada) was applied at BISA from 2007-2009. In 2010 BISA started to extend and redevelop the GCM under the name GEM-Mars. GEM-Mars: 3D GCM with radiative transfer, soil-, surface- and PBL-model, CO2- dust- and H2O-cycle, photochemistry. Its modularity, hence the ease to add future features. Initially developed for the Earth atmosphere, its applicability has been extended to extra-terrestrial atmospheres, such as those of Mars and Venus. ASIMUT has been coupled to SPHER/TMATRIX and (V)LIDORT codes to include the complete treatment of the scattering effects into the radiative transfer calculations. A more detailed description of the ASIMUT - ALVL software can be found here. The broad spectral coverage provided by JWST will permit the characterization of the formation and evolution of global dust storms and cloud systems over volcanoes, while NIRSpec’s spectral resolution will permit the search for trace photochemical species and isotopic compounds. JWST will permit instantaneous measurements of the whole observable disk at very high-spatial resolutions, allowing for the investigation of transient events near the day/night terminator, diurnal (East-West) and seasonal (North-South) phenomena, and the rapid vaporization of polar ices and of other volatile reservoirs. iMARS stands for “international Mars Architecture for the Return of Samples”. iMARS WG is an international Working Group composed of experts selected by the ESA, NASA, and ROSCOSMOS space agencies which has as main objetive the preparation of the Sample Return Mission from Mars. Spectroscopy and forward model error improvement for CH4 retrieval in the TIR. ESA project to explore and consolidate the possible sources of CH4 biases in retrievals from TIR sensors, to establish necessary actions and perform the related work for mitigating biases. The evolution of planets is driven by the composition, structure, and thermal state of their internal core, mantle, lithosphere, crust, and by interactions with possible ocean and atmosphere. The ET-HOME project addresses the fundamental understanding of the relationships and interactions between those different planetary reservoirs and their evolution through time. It brings further insight into the origin and sustainability of life on planets, including Earth. Including, beside the Earth, a whole range of rocky bodies in the Solar System: such as Earth-like planets, natural satellites, and undifferentiated asteroids. The Europlanet 2020 Research Infrastructure (RI) has received funding from the European Union's Horizon 2020 research and innovation programme under grant agreement No 654208 to integrate and support planetary science activities across Europe. The project was launched on 1st September 2015 and will run until 31 August 2019. The project is led by the Open University, UK, and has 34 beneficiary institutions from 19 European countries. Europlanet 2020 RI will address key scientific and technological challenges facing modern planetary science by providing open access to state-of-the-art research data, models and facilities across the European Research Area. The Planetary Aeronomy group of IASB-BIRA is a partner of the project, in particular we will provide new data services for the Virtual Observatory VESPA. The Planetary Aeronomy group of IASB-BIRA is a partner of the project, in particular we will provide ???. coupling of the lower and upper atmosphere and escape to space. All topics are addressed by experts in the field, exchanging results and knowledge in a truly synergistic and interdisciplinary collaboration. The Planetary Aeronomy group of IASB-BIRA is a partner of the project. The goals of the SCOOP (Towards a SynergistiC study Of the atmOsphere of terrestrial Planets) project match the topics, challenges and scope of the BRAIN-be call 2014 of the Belgian Science Policy (BELSPO). SCOOP has as its overarching objective the revision and exploitation of data from the European Mars Express (MEX) and the European Venus Express (VEX) missions as well as other Martian missions such as NASA’s Mars Atmosphere and Volatile Evolution (MAVEN). It will use a synergistic approach by combining different fields of research in aeronomy and integrating the different layers of the Mars and Venus atmospheres from the surface to the upper atmosphere. It will address major open science questions regarding the atmospheric system by seeking to comprehend the interactions between its various elements. SCOOP will also 1) prepare for ESA’s ExoMars 2016 Trace Gas Orbiter (TGO) data analysis and exploitation by developing tools to be tested on selected data from current missions and on the first returned data of TGO; and 2) deliver enhanced scientific context and datasets for defining and designing future missions to our neighbour terrestrial planets. The Planetary Aeronomy group of IASB-BIRA is coordinating the project. The LPAP of the Université de Liège and ORB are also partners of SCOOP. This FP7 project is focused on the realization of innovative tools and techniques for the visualization and sharing of Mars data to strength collaborative science data analysis and real-time operations. A specific focus is given to the preparation of the Exomars 2016 and 2018 missions. Test and exercise the proposed systems in view of the Exomars rover and orbiter missions by using actual data (MEX, MRO, MER and MSL). The participants to this project are the Deutsches Zentrum fuer Luft - und Raumfahrt EV (DLR), the University of Salford (USAL), the Advanced Logistics technology Engineering Center (ALTEC), Thales Alenia Space (TAS-I), the Istituto di Astrofisica e Planetologia Spaziali (IAPS), the Belgian Institute for Space Aeronomy (IASB-BIRA), the Tohoku University and the Johns Hopkins Unversity (JHUAPL). EuroVenus stands for European Unified Research on Observations of Venus using coordinated Space- and Earth-based Facilities. It is a project funded by the EU within the Seventh Framework Programme for Research and Technological Development, EU's main instrument for funding research in Europe. Venus is Earth's closest sibling, but it has ended up with a radically different climate. 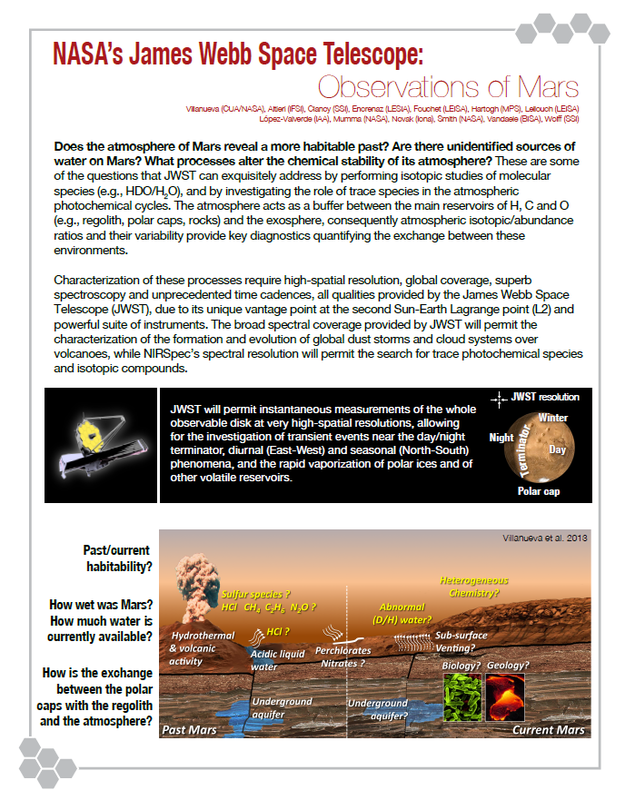 Venus atmospheric science is thus increasingly important in an era in which we are trying to understand the divergent evolutionary outcomes for terrestrial planets, whether we are considering the future of our Earth or the habitability in other solar systems. The goal of this proposal is to investigate in detail the dynamics and composition of the middle and lower atmosphere of Venus by combining data from Venus Express instruments (VIRTIS, VMC, SOIR) with simultaneous data acquired from several ground-based telescope facilities during the course of ESA's Venus Express mission. We will perform coordinated observations to provide a detailed analysis of dynamical and chemical couplings between different levels of the atmosphere that are probed simultaneously by different instruments. The IASB-BIRA contribution to EuroVenus occurs through the SOIR channel of the SPICAV instrument on-board Venus Express. The temperature structure of the upper atmosphere and the light absorption due to aerosols in the mesosphere derived from SOIR data at terminator will help resolving the latitudinal dependency of the aureole observed with a set of coronagraphs during the Venus transit in June 2012. In addition, this project gives access to a platform of complementary ground-based observations and of data from other Venus Express instruments for cross-validating SOIR vertical profiles of temperature, aerosols and minor constituents. Several scientists of the Planetary Aeronomy Group fo BISA are involved in all three teams. The 3 teams had a one week meeting allowing overlap and exchange of ideas between the 3 areas covered. Updates were presented - Comparison between different observations is in progress and scientific publications are in preparation for each team. PLANET TOPERS stands for Planets, Tracing the Transfer, Origin, Preservation, and Evolution of their ReservoirS. The group is an Inter-university attraction pole (IAP) financed by the Belgian Science Policy (BELSPO) and addressing the question of habitability in our Solar System. Based on the only known example of Earth, the concept of habitability refers to whether environmental conditions are available that could eventually support life, even if life does not currently exist. Terrestrial life requires liquid water. The stability of liquid water at the surface of a planet defines a habitable zone around a star. In the Solar System, it stretches between Venus and Mars, but excludes these two planets. If the greenhouse effect is taken into account, the habitable zone may have included Mars in the past while the case of Venus is still debated. Important geodynamic processes affect the habitability conditions of a planet. The group works in an interdisciplinary approach to understand habitability. The dynamic processes, e.g. internal dynamo, magnetic field, atmosphere, plate tectonics, mantle convection, volcanism, thermo-tectonic evolution, meteorite impacts, and erosion, all impact on the planetary surface, the presence or not of liquid water, the thermal state, the energy budget and the availability of nutrients. The Space Physics Division and the Planetary Aeronomy group of IASB-BIRA are involved in the part of the project that deals with the thermal-chemical evolution of planetary atmospheres (net loss, sources and chemical reactions) and its interaction with surface, hydrosphere, cryosphere, and space to determine the evolution of pressure, temperature and composition in time, and the existence or not of liquid water. This includes the greenhouse effect and the regulating role of a magnetosphere on atmospheric losses. The comets and asteroids volatile mass influx from space into the atmosphere are dealt with as well. In 2012, IASB-BIRA was selected for a small amount of funding to start cooperation with India. The Indian Space Research Organisation (ISRO) is planning to send an instrument that resembles NOMAD to Mars in 2014 and was looking for collaborators with experience in radiative transfer models for Mars. A first meeting took place after the International COSPAR conference in July 2012 in Mysore. Further to this positive interaction, more funding was requested to allow more interactive interchange. The BeMind proposal was approved and will allow more face to face meetings in India and Belgium. We hope to have students from India participate in NOMAD calibration experiments and to be able to test NOMAD pipeline on PRISM data after launch! 8-10 May 2013 - A BeMInd meeting took place in Bangalore in May 2013. This was the First ISPA workshop (Infrared Spectroscopy of Planetary Atmospheres) jointly organized by ISRO and BISA. IASB-BIRA researchers presented the Planetary Aeronomy activities of the Institute while their Indian colleagues presented their space activities. Two 'hands-on' workshops were held on how to use the SOIR/VEX data and the ASIMUT-ALVL software. May 2014 - The next meeting organized within the BeMInd project will take place at the Kodaikanal solar observatory in India. The 2d ISPA workshop will be again organized jointly between IASB-BIRA and Indian scientists from ISRO (Indian Space Research Organisation) and IIA (Indian Institute for Astronomy). June 2014 - Finally, the 2014 meeting was organized once more at Bangolare at the ISITE site of ISRO. The agenda comprised 3 full days of presentations, mainly from Indian researchers on Venus and the possibility to build a next Venus mission ! The last 2 days of the week were reserved for 'Hands on': one day on ASIMUT and How to use the SOIR data; the second day: same for VMC and VIRTIS data, plus a very interesting First Course on radar telemetry. HiResMIR is the acronym of the Groupement de Recherche International (GDRI) called "High resolution microwave, infrared and Raman molecular spectroscopy for atmospheric, planetological and astrophysical applications". The aim of this "Groupement" is to promote the exchange of ideas between researchers of eight laboratories belonging to five countries (Belgium, France, Germany, Italy, and Spain). Each institute brings its own worldwide-recognized expertise, complementary to the other HiResMIR partners. Broadly, these expertises are of two natures, centered on Molecular Spectroscopy and its application in atmospheric, planetological and astrophysical research. Some of the HiResMIR members (Aachen, Bruxelles-ULB, Madrid, Namur, and Paris) are experts in the generation of accurate reference spectroscopic information (such as positions, intensities and shapes of spectral lines) for molecules of atmospheric, planetological and astrophysical interest. For that purpose, they combine various experimental high-resolution spectroscopic techniques (microwave, infrared or Raman) with high-level theoretical treatments. Other HiResMIR partners (Bologna and IASB-BIRA) are concerned with the detailed study of the Earth and planetary atmospheres using optical remote sensing techniques. They are therefore users of reference spectroscopic parameters. The multidisciplinary activities of the partners of the HiResMIR GDRI are therefore strongly linked. However, interactions between these two kinds of expert groups occur on too rare occasions. Discussions and exchanges of ideas to be promoted by the HiResMIR GDRI is an opportunity to contribute to filling this gap. An international thematic school has been organized in the framework of this project in Fréjus from 3 to 7 June 2013. HiResMIR@CAES-Frejus-2013 will focus on high-resolution spectroscopy and its application for investigating physical or chemical processes taking place in the atmosphere of the Earth and of other planets as well as in the interstellar media. An international Summer School has been organized in Saint-Pierre d'Oléron from 11 to 14 June 2017, SPECATMOS2017. The school focused on the "Spectroscopy and Atmosphere: Measurements and Models" and was a 1-week program dedicated to outstanding and enthousiastic Master-PhD students and young researchers who want to acquire an interdisciplinary scientific culture from leading scientists..
SIROCCO is a 18-months ESA project focusing on "Development and performance assessment of synergetic retrieval algorithms for near-surface concentrations of CH4 and CO from SWIR and IR passive remote sensing measurements for Earth and Mars atmospheres". The consortium is led by J. Chimot at NOVELTIS. It includes M. De Mazière's team at IASB-BIRA, J. Landgraf's team at SRON, P.-F. Coheur's team at ULB, M. Giuranna's team at IAPS and A.C. Vandaele's team at IASB-BIRA. To provide recommendations on the needs and specifications for co-located SWIR and IR measurements for the monitoring of near-surface CO and CH4 concentrations.